It is Chess time now, and how can we miss it with our own Visvanathan Anand in. Game.1. 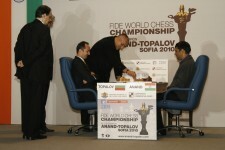 Topalov took the first match playing white. Topalov opened with 1.d4. 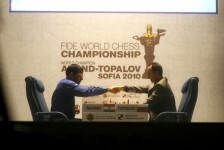 Anand adopted Gruenfeld Indian, which he used in most of the matches in 2009. Topalov, took the game to different levels by move 16, and by move 23 with a Rook lift Rf3 , exposed the fragile Black Castle. 29th Bb5 was replied by Qxe4, and Topalov finished of Rxc8 to take the match in 1 Hr 21 Mts. Game.2. Anand takes the game playing white to tie at 1:1. Anand opened with Catalan. Topalov responded 4..dxc4, to create an imbalance. By move 15, the queens were exchanged, but the move of the match was a hasty Ne3 at 25 by Topalov, which perhaps costed him the match. Topalov's move to trade of Rooks was wisely declined by Anand, and by move 43, the game was Anand's in 1 Hr. 08 Mts. Game.3. Drawn. Scores 1.5 : 1.5. In the third game Anand playing Black, dogged Topalov down to a draw.Topalov's self invoked Sofia Rule of no draws, came to a nought at the 46th move. It war a grand and calculated play by Anand, with only Bishops, Rooks and a Knight each after 13th. The game ended in a draw in 46th move in 1 Hr.07 Mts. Topalov saw another Catalan opening with Anand on white. Anad just ripped through Topalov's Queens side, by creating weakness in the pawn structure. By 18th move it was only Anand on board.The match was over by 32 nd move in just 21 Mts.